ARUCAD > Duyurular > Assoc. Dr. Mustafa Akkaya’s “Encounters” solo exhibition is opening. The personal exhibition of Dr. Mustafa Akkaya, titled “ENCOUNTERS”, has been extended until the 10th of February 2019. 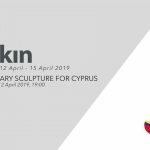 Dr. Akkaya is a lecturer at our Plastic Arts Department and the exhibition can be viewed at Nicosia’s ARUCAD Art Space.